It is no secret to anyone that camera is the center of attention of the new Huawei P9: which has dual 12 MP sensor, one monochrome, which means that only captures images in black and white and other RGB, which manages to detect color. Both sensors are developed by the famous Japanese company Sony and manufacture of this dynamic duo was advised by the company Leica, which is a legendary and important German brand specialized in the photography since many years ago and that despite the passage of the years and new technologies, always says this in the field of photography. The interesting monochromatic sensor allows registering more details about photography because it only focuses on capturing how much light is available in the environment. Meanwhile the other sensor (RGB) is responsible for determining what color is the light that reaches the camera. At the end of this process of analysis, the information collected by both sensors is attached and generate a flawless photo. The Huawei company indicates that due to the existence of the new monochrome sensor, the camera now captures up to 270 percent more light than the iPhone 6S and 70 percent more than the Galaxy S7. The large advertising promotion that was done to the camera was the subject of considerable controversy, because it was discovered that a photo used in the marketing campaign, supposedly had been taken with the P9, but actually was taken with a professional camera. But beyond that move so controversial, the new P9 offers truly amazing results. These results are spectacular: images with a very good dynamic range, excellent color management and impeccable level of detail, both in a good light conditions and dark places. 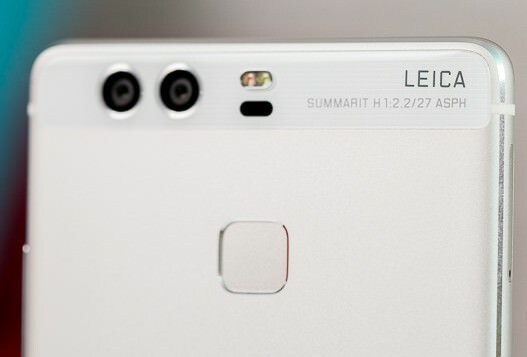 In the case of close-ups, the new P9 uses laser technology approach. In the case of distant goals, attends a triangulation technique: for which determines the location using two points of view. But if for some reason none of these techniques work, goes to a contrast approach.